I recently purchased a .io domain for agw.io. It cost me $50, which was pretty good considering every other place I looked had a .io domain costing $100+ and I am even considering buying additional domains from them. Their website is called iwantmyname.com. Now that I have payed the homage I feel was due, I would like to share my new website with you: agw.io. Simple to remember, not exactly what I wanted: aw.io, but good none the less. I decided I would also create a new email [email protected], doing so allowed me to (1) decrease the size of my resume and contact info on my information cards i.e. 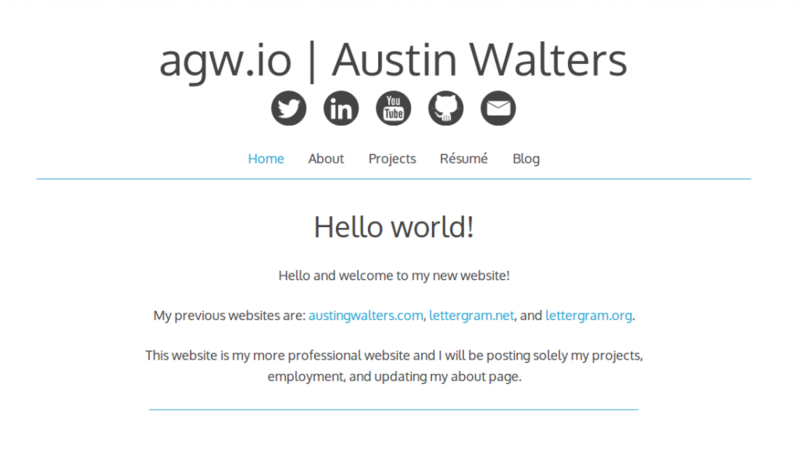 agw.io | [email protected], (2) it was easier to remember than [email protected] https://austingwalters.com. Why I felt I needed a new url and website. This has turned into somewhat of a blog, I post what I feel/see/some programs/thoughts, but only part of it is related to my professional life. Therefore, agw.io will be completely dedicated to my professional life. I will link my page to this blog, but my resume and what not will be kept at agw.io. The new look, I am proud to say the new look is amazing! The main reason I decided to make a new website was because I wanted my employer to understand that I like clean, organized, and effective websites (hopefully giving them an appropriate reflection of me! ).